Resistance band workouts are extensively used by a range of health and fitness experts for general strength, resistance training, injury prevention and rehabilitation. The bands are perfect for devising home exercise programs and can easily be added to existing circuit training workouts for both cardiovascular conditioning and developing strength in particular muscle groups. Here are some resistance band exercises you can practice. The first advantage of using resistance bands for your workout is that the equipment is cheap and portable. The bands can be easily packed into a suitcase and can be used anywhere, including in hotel rooms. 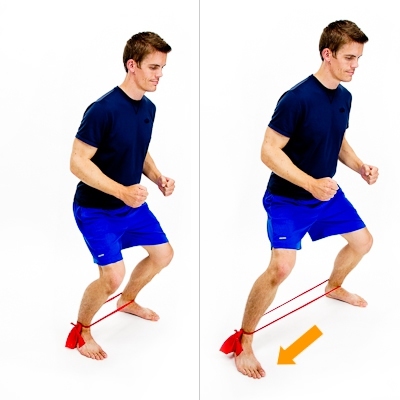 The second key benefit of resistance band exercises is their use in rehabilitation programs following injuries. Resistance bands have long been used for effectively toning injured muscles, and they allow gradual increases in the stress as strength is regained. The exercises recommended below aim at toning the muscle of your chest, arms and abdomen. a) Place your feet shoulder-width apart in the center of the band. b) Bend your knees slightly, leaning forward from the waist, ensuring your hips stay back. Grasp the band handles with both hands, with palms towards your knees. c) Keeping elbows bent, pull the handles towards your hips, until your elbows are at 90 degrees, with your shoulders squeezed together. d) Lower your arms to the starting position. Go for 10-12 reps.
a) Anchor the band at chest height to a cable column or stable support. b) With your back to the band, grab a handle with each hand. With hands at chest height, take a step forward to reduce the slack. c) Press your hands straight forward, keeping elbows up and palms down until your arms are fully extended and your chest muscles are contracted. d) Return to the starting position. Do 12-15 reps.
a) Position your feet shoulder-width apart in the center of the band. Grip each handle with your palms in front of the thighs. b) Pull the handles straight up the front of your torso to shoulder height. Keep your elbows bent, so they make a “V” shape at the top of the movement. c) Gently lower back to the starting position. Perform this rowing exercise for 10-12 reps.
a) Sit with your legs stretched out in front. Wrap the middle of the band around the center of your feet and grab the ends. b) Bend your knees slightly, keeping your feet on the ground. Lean back 45 degrees. c) Take your left hand across your body and your right hand down towards your right hip, squeezing your obliques. d) Return to the start. Rotate left then right until you’ve completed 10-12 reps on each side. The target of the following exercises is to train your thighs and hip. a) Stand in the middle of the band with feet hip-distance apart. b) Holding one handle in each hand, take hands up to shoulder-level with elbows pointing downwards. Stand tall, engaging your core. c) Inhaling, push your bottom back, as if sitting down. d) Ensure your chest is lifted, your weight is over your heels and that your knees do not pass your toes. e) Exhaling, push up back to the starting position. Do 8-12 reps.
a) Grasping the handles, place your foot in the middle of the band. b) With your hands over your shoulders, step back with one foot, keeping the back heel off the floor. Ensure your back is straight and your core tight. c) Inhaling, lower the back knee to a few inches off the floor so it makes a 90-degree angle. Keep your shoulders over your hips and don’t lean forward. d) Exhaling, push back up, pressing the front heel down. Repeat 8-12 times on each side. a) Tie a therapy band around your lower legs, or step into a loop band so it is just above your ankles. b) Taking a half squat and placing your weight on your left side, step to the right with your right leg. c) Take the standing leg in a bit, but keep the band taut. Take 8-10 steps, then repeat on the other side. a) Sit on the edge of a chair. Tie a loop band around your legs, slightly above your knees. b) Position your feet slightly wider than shoulder-width apart. Gradually turn your knees outwards, rotating your feet as your knees move outwards. c) Hold the position for 2 seconds, then bring the knees back to the center. Go for 15-20 reps total. You need to perform the resistance band exercises slowly and under control. The tension in the band should increase during the exercise. To make the exercise harder, shorten the length of the band you are working with to increase the tension over the range of movement. Remember that the tension of the band changes throughout the exercise. The resistance will be the greatest when you reach the end of a movement. It can be hard to measure your progress with bands, as different tubes and bands have various resistances that may be hard to estimate. Exercise bands are very susceptible to wear and tear. Before you start your workout, make sure the band you are using doesn’t have any rips, even small ones.